Patty's Utopia: Un Billón de Pie Seattle/ One Billion Rising. Un Billón de Pie Seattle/ One Billion Rising. On Thursday, February 14, 2013 there's a call for all women and all who love women to rise against violence. How? THAT my friends, is the fun part but first, let me give you a little background on the subject. I have the pleasure to know one of the women in charge of mobilizing ALL Latinas here in Seattle to participate in this fun event. Her name is Penélope Lara. She explained to me that she and Giselle Zapata-Garcia met a speaker from Mexico who introduced them to this project and since they have always been advocates for pressing issues in our community, they decided that this was a worthy cause for them to get involved in along with another dear friend and colleague Cecilia Martinez-Vasquez. After they did some research, they realized there was another group already planning this event in English so they decided to join forces but continue with the mission of offering a culturally relevant event in multiple languages. They decided to have it in Spanish because the Spanish speaking community in the state of Washington and Seattle particularly is a growing ethnic group. "Many needs of the community have not been met and this event will bring awareness, and it will highlight an issue that is unspoken of and considered private, not public. Taboos in the community and gender dynamics are usually at play when it comes to addressing issues of violence within the Spanish speaking community. Also, issues of legality, language barriers, and cultural misunderstandings/differences contribute to the silencing in regards to violence, especially against women. For all these reasons, we must address violence not only in English, but also in Spanish, and as many other languages and ethnicities as possible." - Said Ms. Lara and Miss Martínez-Vasquez - "In order to help make this event a huge success, we need you to spread the word about the importance of having an open conversation within our families and communities about the many ways in which violence against women and girls impact our lives – cycles of poverty, normalization of violence, promoting of unhealthy gender dynamics, etc. Encouraging each other to talk and normalize the discussion – we need to feel that talking about violence is no longer a taboo or a closeted issue, it has to be out in the forefront in order to be addressed and ended. It's important to ensure that women around the world feel supported by the other women in their lives when addressing these issues." On Valentine's Day, February 14, 2013, we are asking one billion women and those who love them to WALK OUT, DANCE, RISE UP, and DEMAND an end to violence. Remember: ¡SÍ SE PUEDE! 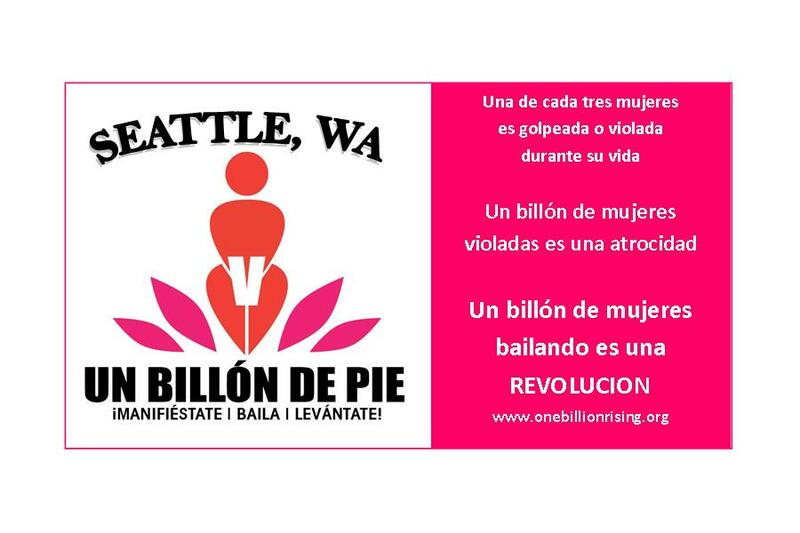 For details and updates on the time and place visit their Facebook event page: One Billion Rising / Un Billón de Pie Seattle. With Penny Lara during the photo shoot and PSA video shooting for Un Billón de Pie Seattle. Rosario Dawson on why she is joining Eve Ensler's campaign.